The hotel is 20 kilometres from Aqaba International Airport and just 10 minutes drive from the city centre. A shuttle bus will run hourly services between the hotel to Aqaba's city centre and the airport. 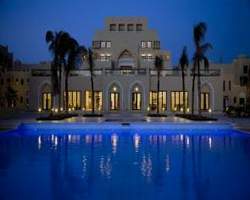 Radisson SAS Tala Bay Resort Hotel 336 stylish guest rooms will all come with stunning views over the Red Sea and include Bay rooms, Junior suites and Executive suites. Non-smoking rooms and rooms for disabled guests are also available upon request. All rooms will come equipped with high-quality amenities such as flat-panel LCD televisions and free high-speed Internet access. Open from early morning until late at night, guests can enjoy modern international dishes at Aziab, the hotel's all day dining restaurant. In the morning, the Super Breakfast Buffet serves dishes from North America, Scandinavia and the continent as well as a traditional English breakfast. The restaurant is non-smoking and provides guests with views overlooking the hotel's pools. An outdoor terrace allows for al fresco dining. Beautifully situated just outside the hotel, the Sunset Deck lures guests with pungent aromas from its tantalizing outdoor grills. With a mixed menu of local delicacies and international dishes, guests can feast on a variety of grilled delights while soaking in views of the Red Sea and the beautiful hotel pools. Complementing this is a wide assortment of Asian, Moroccan and traditional teas as well as water pipes for smoking aromatic apple, strawberry, lemon tobaccos and more. Guests lounging by the Radisson SAS hotel's pool can easily find great light bites and drinks at Baywatch. This open-air café offers the perfect menu for those who have spent several hours worshipping the sun and just need a little something to tide them over til dinner. Enjoy ice-cold smoothies along with light salads and bar snacks. The café also caters for children with a special kid's menu. Located in the Radisson Sas Hotel's lobby area, Kenzi Lounge is an ideal spot to meet up with friends and family. The lounge offers an extensive variety of snacks and desserts including delicious ice creams as well as hot and cold refreshments. The lounge also caters to more indulgent tastes with a selection of fine cognacs and cigars. The Radisson SAS hotel offers two outstanding meeting rooms, each spanning 100 m². Ideal for hosting small to large meetings, events and private functions, Radisson SAS hotel rooms are designed to exceed expectations. All rooms are equipped with the latest conferencing technology as well as wireless high-speed Internet access. With a wealth of aquatic activities to choose from, our staff is happy to help arrange team-building exercises, outings and excursions around the resort and the Gulf of Aqaba. The hotel offers 5 beautiful pools, (all heated in winter) which each serve a different function for guests. The Square pool, the Infinity pool and Main pool areas are perfect for lounging and enjoying the Arabian sun. These pools elegantly jut up each other as water spills over between the two of the areas. More active guests can spend some time training at the Lap pool while children can splash away at the Kid's pool. Rounding out the picture are 2 outdoor Jacuzzis. At sunset, the pools become illuminated with a colourful light display of brilliant purples, green, blues and more. Guests can dip their toes into the Red Sea at the private beach. Be treated to ancient Indian Ayurveda treatments overseen by expert staff at the Ayurveda Wellness Centre. Indulge in a 90 minute oil bath treatment or an hour of pure bliss with a unique Kerala-style massage called Dhara. Full body massages, head treatments, scrub massages and facial treatments that draw its roots from the oldest form of medicine and health sciences are available. After a long day of sightseeing or meetings, guests of the Radisson Sas Hotel can enjoy a workout using equipment at the hotel's fitness area. Located outside, guests can breathe in fresh air from the Red Sea while exercising.